Summer is here and with it all the outdoor sports we love to indulge in – tennis, jogging, tai chi, surfing… To take care of yourself while you’re taking care of yourself, have a go at the line of Weleda products designed for athletes. The line is all natural and good for professional athletes as well as those of us who simply get outdoors to get in our workouts. Creme Sani-Pieds – This foot cream is made from organic myrrh and calendula extracts with lavendar and orange essential oils added. It’s non-greasy and leaves your feet feeling soft and refreshed, while aiding with perspiration. Silver Birch Juice – To be mixed with water and drunk after your workout or throughout the day, this concentrate of silver birch leaf juice aids in elimination of toxins. The organic juice contains different substances whose “flavonoids” aid in elimination. Copper Sulfate Tonic Gel for Legs – Runners and speedwalkers know the sensation of “heavy legs.” It comes from miles of pounding the pavement. This refreshing and tonifying gel, greaseless, is made from extracts of copper sulfate, lemon, arnica and essential oils. Keep it in the refrigerator for a particularly intensive after-workout therapy for your legs. Weleda is a Swiss company that has been devoted to organic well-being products for 90 years. It is the official partner of INSEP (Institut National du Sport, de l’Expertise et de la Performance) and has been chosen by the French medical commission for the National Olympic Committee of Sports for the London 2012 games. Next time you are in Paris, book yourself and your sweetheart for a couples massage and, time permitting, a massage workshop. The Espace Weleda just off the Champs Élysées is a naturally inviting space that is used as a spa and also, primarily, as a place to educate clients about the Natrue certified Weleda products and how to use them effectively. 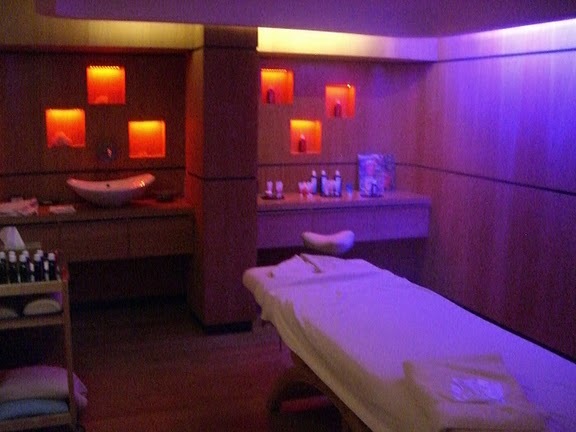 Workshops are held several times a week and the couples massage workshop is very popular especially around Valentine’s Day. ripple effect around the world. * Live sustainably. It’s all connected. Treat your entire body to a delicious and sumptuously organic and good for you treat this Earth Month. 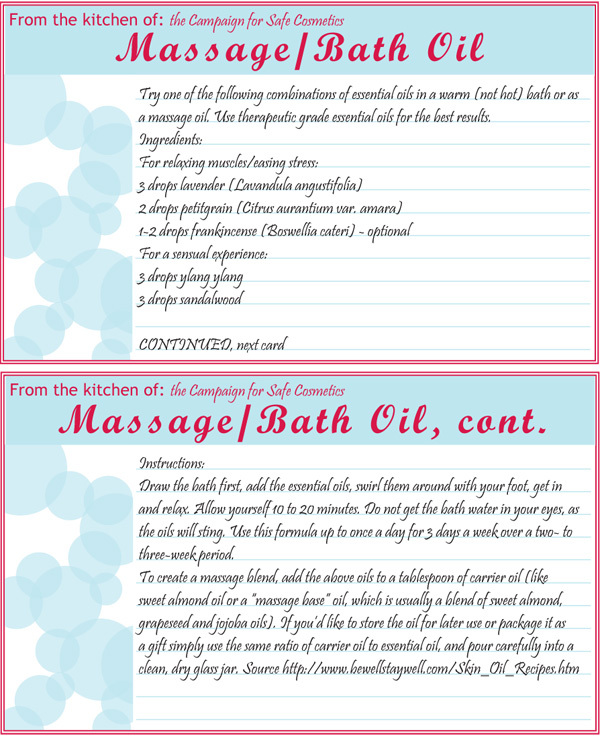 Good Earth Body Care is a homemade beauty product line that treats your inner wellbeing while also caring for your outer beauty. Cathy is from Ashland, Oregon where she sells her Organic Clear Release Mist, Lavendar Face Cream, Rose Face Cream, Healing Skin Salve and a range of other intoxicatingly natural products at the local markets. She has spent her time researching the natural properties of the plants, flowers and essential oils that she uses in her line of treatments. For example, the Organic Clear Release Mist “Calms nervous system, releases negative emotions and clears subconscious stress.” All with a little spritz. And they come in handy purse-sized or desk-sized bottles so you can be ready with a dose of essential oils for those moments when your day gets a little cloudy. Origin: Leaves and sometimes fruit and bark of the ravensare tree. Benefits: Warming and revitalizing. Helps with flu, bronchitis, viruses and shingles. Origin: Fresh petals of the rose. Benefits: Soothing, comforting, anti-depressant, and a heart tonic. Helps with dry, mature skin, sensitive skin, wrinkles and stress. Origin: Powdered, dried roots and heartwood of the sandalwood tree. Benefits: Soothing, relaxing, grounding, purifying, and a sedative to the nervous system. Helps depression, nervous tension, and stress. Origin: Leaves and twigs of the tea tree. Benefits: Penetrating, stimulating, and refreshing. Helps with athlete’s foot, burns, cold sores, insect bites, oily skin, and rashes. Origin: Leaves and flowers of the thyme herb. Benefits: Stimulating, refreshing, and purifying. Helps with colds and flu. Origin: Roots of vetivert grass. Benefits: Soothing, grounding, and sedating to nervous system. Helps with depression, nervous tension, and releasing deep fears. Origin: Fresh flowers of the ylang ylang tree. Benefits: Soothing, calming, and sedating. Helps with acne, irritated, and oily skin. This Earth Month go ahead, pick some Good Earth products for yourself and for your Boss and maybe that co-worker too! Commuun is one of the few Designer labels showing in Paris regularly who sport an ethical fashion approach. And like their famous colleague (Stella) their front foot is on design with their inspiration derived from nature, a respect they carry forward into their fashion designs from collection to collection. When asked backstage what is the one constant in their collections, Iku Furudate and Kaito Hori responded that sourcing organic textiles is one of their trademarks for their collections. This year’s runway shows in Paris saw a lot of sheers, material that Commuun often uses in their collections. Many of the fashion label’s fans at this year’s runway show in Paris held on March 7th agreed that this year’s collection bears witness to the design duo’s maturation and growth into their world-class label. Some of the textiles they used – all organically sourced – included an inversed velvet. The pops of color in the collection, too, are nature inspired and their name has nothing to do with “common” but rather references the concepts of community, communion and communication. Paige Donner is Founder and Ed. In Chief of Greening Beauty and Greening Hollywood as well as The Green Blog Network. 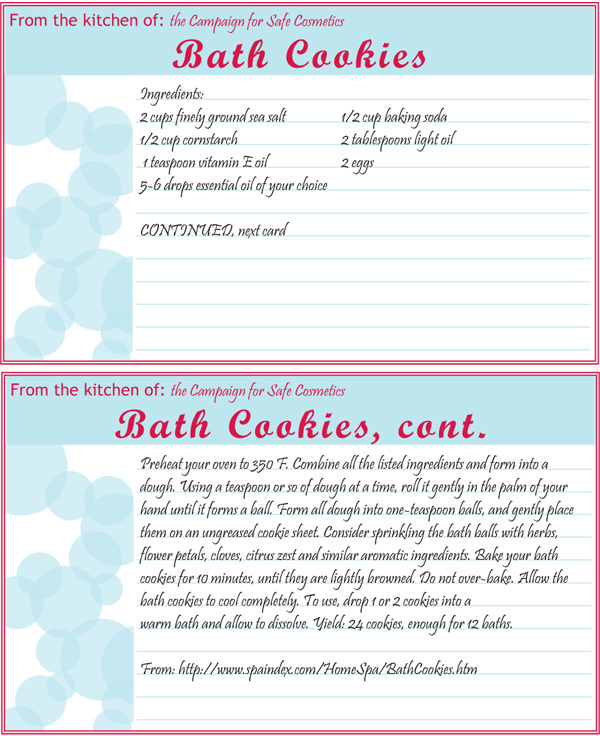 Try some of these DIY beauty recipes from our friends at Campaign For Safe Cosmetics. For more Tips and Recipes, click HERE. The cocoons that Parisian architect Pierre David designed for the smallest of all the Six Senses spas are made from hand shaped light oak wood and are lined inside, like a Japanese lantern, by back lit paper. There are 4 single treatment cocoons and two for couples. There is no more ideal setting to receive a Paris Rooftop Honey Facial than inside one of these terrestrial cocoons. A couple of blocks down from the bejeweled Place Vendome and a few up from the gorgeous Tuilieries Gardens, you will come upon the door of the Six Senses Spa. The first thing that strikes you as you ring their bell, will be the vertical planted “Living Garden” wall that hugs the polished wooden stairway leading down to the spa treatment area. Living walls have become popular indoor and outdoor urban features and not just in Paris. The Quai Branly Museum boasts a living wall on its exterior, and the Six Senses Spa boasts a living wall on its interior. You are immediately sealed off from the brouhaha of the busy Parisian street as the glass door is opened by remote pushbutton and you are welcomed into the warm and inviting sensorial spa waiting for you at the foot of the stairs. 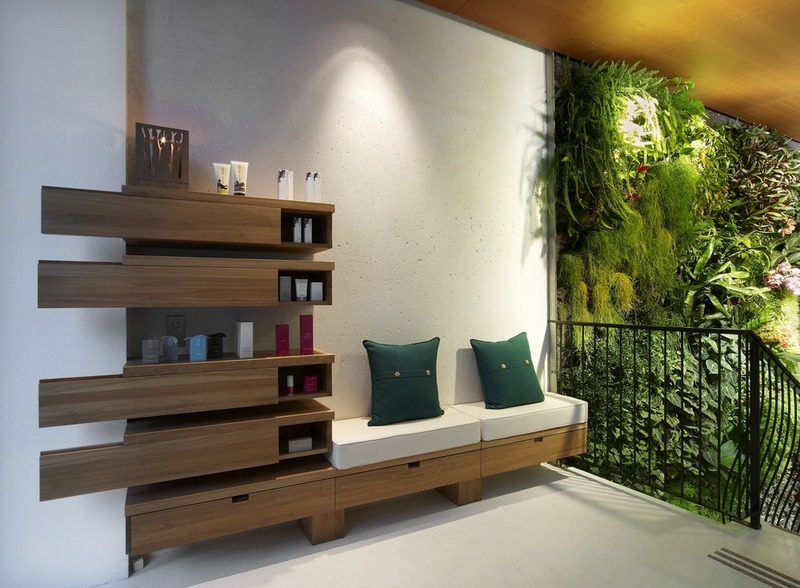 The Living Wall is an important statement for Six Senses and goes well beyond a simple design choice. The entire philosophy of Six Senses spas are: SLOW LIFE. Sustainable Local Organic Wholesome. SLOW. Learning Inspiring Fun Experience. LIFE. The husband and wife team, Eva and Sonu Shivdasani who created Six Senses have embraced their service mantra, “Atithi Deva Bhava.” It means Guest is God in Sanskrit and they have scented their entire operation with that philosophy. 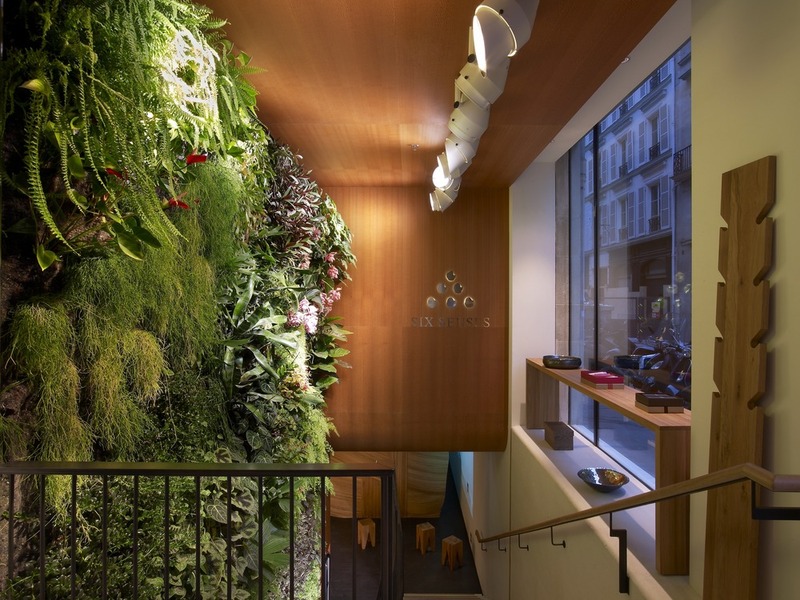 Hence, the Living Wall that is the first visual to greet you upon entry at rue Castiglione, Paris was chosen with the mindfulness that nature receives you into this oasis of wellbeing and healing. 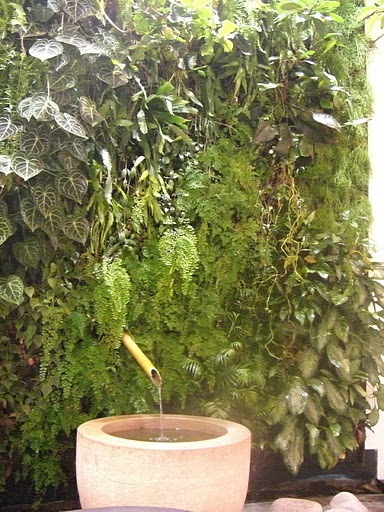 The Vertical Garden helps eliminate CO2 emissions and other toxic elements as well as being a refuge for biodiversity. On a subliminal level, the wall instantly signals to you that you are now in nature’s care and that more than just your physical beauty will be looked after. Bulgari launched a unique silver and ceramic ring modelled after the famed B.zero.1 line in October 2010, with $75 from each ring benefiting Save the Children. For 2010-2011, Bulgari has made an additional commitment of $7.4 million to Save the Children to help fund education programs, healing and education through the arts, teacher training, and other related programs in China, Colombia, Democratic Republic of Congo, Haiti, Indonesia, India, Ivory Coast, Kenya, South East Europe, Southern Sudan, Uganda and the United States. 1 vintage gold Bulgari Melone handbag, from Camilla Dietz Bergeron, Ltd.
Recognizing that education has the power to transform lives, Bulgari has since 2009 partnered with leading non-profit organization Save the Children to provide quality education opportunities for the world’s most vulnerable children. In 2009, Bulgari raised over $9 million to support education programs and teacher training in Afghanistan, China, Colombia, Democratic Republic of Congo, Haiti, Indonesia, Ivory Coast, Southern Sudan, Uganda and countries in South East Europe. Proceeds from the sale of a much celebrated silver anniversary ring contributed to Save the Children’s Rewrite the Future campaign, which targeted support for over 10 million of the world’s children. The design-your-own trend is one we’ve seen brought to countless product categories already, including — on several occasions — dresses. What’s interesting about New York-based Coco Myles is that it brings the concept to bridesmaid dresses, allowing the bride to choose the colour scheme while the bridesmaids design their own styles. Consumers can create a variety of types of dresses at Coco Myles, including those intended for special events such as weddings and proms. All dresses are custom-made to the customer’s specifications and then cut and sewn by hand by a team of professional dressmakers. That’s all well and good, but the company really caught our eye for its special services for brides and bridesmaids. Specifically, brides can use the site’s tailored interface to choose the color and other features of their bridesmaids’ attire while permitting the wearers to choose a style that is right for their own tastes, body type and comfort. Available in sizes 0 through 32 — including maternity designs — Coco Myles’ custom made-to-order dresses take only about five weeks to produce and cost approximately USD 150. A Bridal Fabric Reservation System even lets brides make sure that their bridesmaids’ dresses are all cut from the same bolt, no matter when they get ordered. So Choose Eco! Choose Fair Trade Textiles!! Peace Silk!! Stylist Nathalie Garçon, the ambassador for Paris, Shopping and fashion capital,has a chic, ethnic style full of colour. Having discovered her love of fashion in Cannes, where she is originally from, she now considers herself 100% Parisian and tells us all about “her” capital. Parisian by adoption for 30 years, you know the capital better than many of its citizens. If you had to persuade someone to visit for the first time, what would you say to them? N.G. : It’s the most varied and disconcerting city I know, with such a classic air. It’s constantly changing with the times; a capital that manages the ultimate mixture of a rich historic past and the eclectic influence brought by a large influx of foreign visitors. But it’s also a dream city for any fashion lover! If you were to spend 24 hours rediscovering Paris, in your own way, from breakfast to late evening, what would you choose to do? N.G. : First of all, I’d have breakfast at Dalloyau in the 6th, with its view over the Luxembourg garden, followed by a walk and certainly a game of tennis in the “Luco”, which I absolutely adore. I’d then stroll around the surrounding streets for a bit of shopping, before stopping off around 11.45am, for a coffee at Flore, boulevard Saint-Germain, and a bit of people-watching. I’d then head towards the Musée du Quai-Branly to rediscover the collections of oceanic masks which is just as enjoyable each time I visit. Then it’d be off to Trocadéro, for a bit of a walk and to admire the Eiffel Tower; passing by the terrace at Carette, a hot spot for Parisians. After that I’d go to the Marais district and get a Vélib; a quick stop along the lively rue de Bretagne for some organic fruit, and then I’d take a look around the Musée Picasso. I’d have lunch quite late on rue Charlot, in one of the little restaurants that have recently opened there, before continuing on to Drouot, where I’d hope to find something a bit unusual. At the end of the afternoon, a drink at the bar of the Meurice, before a trip to the theatre. Dinner at Cristal de Sel, a little bistro I love, one last drink at Mathis and finally to bed! As an internationally renowned stylist, is Paris a source of inspiration? N.G. : Paris instills into creators a subtle mixture of freedom, fantasy and elegance. But it’s also a multicultural capital, and so open to the entire world, making its influence both very Parisian and completely cosmopolitan at the same time. Paris is continually evolving, with new boutiques, but also the opening of many palaces in the coming months. Do you think that this return to such grand luxury will breathe new life into the city? N.G. : These palaces are both a reflection of a constantly changing world, and a strong sign of the end of the economic crisis. Paris is offering a large number of exceptional venues that will attract foreign visitors, many of whom may never have previously visited the city; they will also bring back visitors who are looking for high quality, up-market accommodation. The elegance of Parisian women is often the envy of the world. But what do you think of Parisians, and what would you like to suggest to them? N.G. : Definitely a bit more fantasy and freedom, both of which are fun. Men are definitely less favoured than women with regards to day-to-day fashion, as they’re still limited to a suit at work, but a simple accessory in a lively colour or elegant shoes would add a bit of creativity, making it less dull. And certainly more humour and lightness … And if their professional environment doesn’t allow them freedom with their clothes, my main advice would be to try and make a real effort at the weekend, rather than slouching around in jogging bottoms or other clothes that may very well make their own grandfathers blush! You’re the ambassador for Paris, Shopping and fashion capital. For the “Soldes by Paris”, what advice can you offer to visitors and Parisians looking to make the most of the sales? N.G. : The sales are always a chaotic time that merit a bit of practical preparation: good shoes (don’t wear them if they’re new! ), clothes that are easy to take on and off in the changing rooms without a struggle …Then, you also need to make sure you avoid the well-known areas, as they get very busy. Go and discover new places during the sales with friends; and of course an outside opinion is always handy to avoid those shopping mistakes! A feature documentary spanning 80 years of revolution in culture, as told through the life of one extraordinary man, VIDAL SASSOON THE MOVIE is the revealing and inspirational story of how one man changed the world with a pair of scissors. VIDAL SASSOON THE MOVIE is a true rags-to-riches tale, tracing Sassoon’s path from a London orphanage to international success and celebrity. Producer Michael Gordon, founder of natural hair care company Bumble and Bumble, first set out to document Vidal’s life in a richly visual book about icons in the world of hairdressing. What started as an 80th birthday tribute to Sassoon became a movie when Gordon brought on director Craig Teper. While chronicling the fashion, style and social revolutions of the 1960s, VIDAL SASSOON THE MOVIE shows how Sassoon revolutionized the world of hair with his pioneering, geometric, Bauhaus-inspired styles and “wash and wear” philosophy, literally changing the way women look and cut their hair today. Phase 4 Films will release VIDAL SASSOON THE MOVIE in New York on February 11th, 2011 and in Los Angeles on February 18th, 2011.